Here is the first social history devoted to the common soldier in the Russian army during the first half of the 19th-century--an examination of soldiers as a social class and the army as a social institution. By providing a comprehensive view of one of the most important groups in Russian society on the eve of the great reforms of the mid-1800s, Elise Wirtschafter contributes greatly to our understanding of Russia's complex social structure. Based on extensive research in previously unused Soviet archives, this work covers a wide array of topics relating to daily life in the army, including conscription, promotion and social mobility, family status, training, the regimental economy, military justice, and relations between soldiers and officers. The author emphasizes social relations and norms of behavior in the army, but she also addresses the larger issue of society's relationship to the autocracy, including the persistent tension between the tsarist state's need for military efficiency and its countervailing need to uphold the traditional norms of unlimited paternalistic authority. 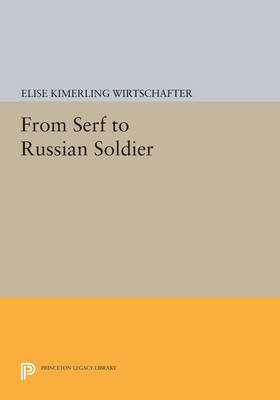 By examining military life in terms of its impact on soldiers, she analyzes two major concerns of tsarist social policy: how to mobilize society's resources to meet state needs and how to promote modernization (in this case military efficiency) without disturbing social arrangements founded on serfdom. Originally published in 1990. The Princeton Legacy Library uses the latest print-on-demand technology to again make available previously out-of-print books from the distinguished backlist of Princeton University Press. These editions preserve the original texts of these important books while presenting them in durable paperback and hardcover editions. The goal of the Princeton Legacy Library is to vastly increase access to the rich scholarly heritage found in the thousands of books published by Princeton University Press since its founding in 1905.